Today, my husband and I are flying to Florida without our two kids to celebrate our 8 years of marriage. This is our first extended overnight stay without kids since we had kids! It is probably well overdue and it should be nice to get away. Well, it is probably still good to get away and now that we’ve done it, maybe it will be easier to do it again! First of all, since I want to keep up my milk supply, I wanted to pump every 3 hours to match when my little one normally eats. Well, while waiting to board the plane I did a quick calculation and realized that it will be several hours of flying... then who knows how long it will take to get the car rental. Therefore, it'd be best to pump before we take off. In retrospect, I should have looked hard for one of those family restrooms where I'd probably have more privacy. Well, I was desperate enough that I just ended up at a public airport restroom. It was a good thing they have outlets on the walls! It was also a good thing that it was not so busy. Perhaps it was weird for the 2-3 folks who have to use the sinks near me but I really didn't care at that point. However, next time, I'll have to find my battery pack so I can do this inside a stall. What good is a travel pump if there is no power source? After we landed, there was a long line to get our Hertz car rental. While hubby waited, I made another trip to the restroom to pump. This time I did find a family restroom with an outlet by the sink, so it was a much more private pumping session. 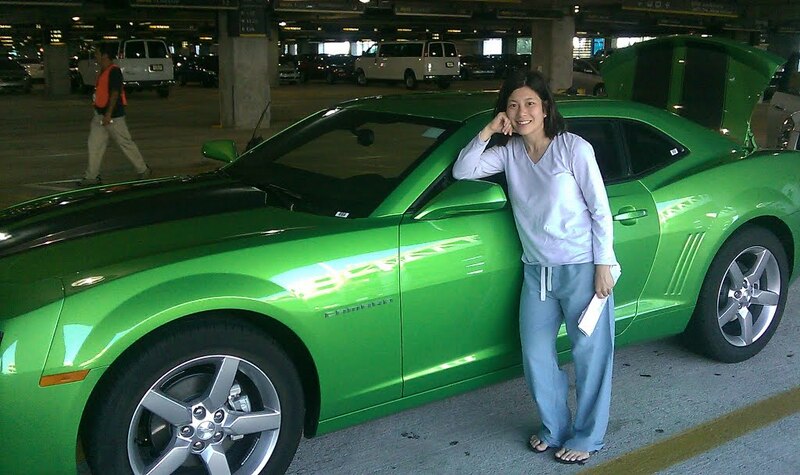 I returned in time to see the rental lady hand keys over with a huge grin on her face. We were going to drive a camaro... and it was green! There were no more mid-size vehicles so we got an unexpected upgrade. To be quite honest, I had no idea what all the excitement was about until we walked up to the car. Hahaha... this ended up being the highlight of our entire weekend! We hit the road! Our plan was to drive to this vacation home in Palm Coast, Fl. It is supposed to take us about one hour I'm told and I'm directed to look at the map to help navigate us there. We flew in to Ft Lauderdale which is pretty much at the bottom of Florida.... Palm Coast... yep... pretty much near the top of Florida. So you know, I just took my husband's word for it that it was supposed to be a one hour drive. Maybe it crossed my mind briefly that we were driving from one tip of the state to the other tip but I brushed it aside because hey... my husband usually knows what he is talking about it. Since it was lunch time, we wanted to stop by a beach to grab lunch and maybe hang out a bit. We ended up at Delray Beach and the water was awesome! How long should we stay? "Oh, it should only take us about 30 min from here" says my husband. Really? Okay... so we chilled at the beach until it was close to dinner time. Then we get back into our cool rental car... oh and we were getting all sorts of comments by admiring passer-bys which never happens with our kid friendly cars back home. Hubby plots the gps and tells me the gps is giving him erroneous information and asks me to plot it and check the zip code. I plot it... 240 miles (4 hr drive)!! I look at the map.. yep... makes sense to me... man, I knew something was off when I was looking at the map earlier! Ohhhh... maybe we were supposed to fly to Jacksonville and not Ft Lauderdale airport... Hahaha... well if we're going to have to drive at least we'll be doing it in a sports car! Wow... this is getting way too long... will have continue the rest of the story tomorrow... there's more! !